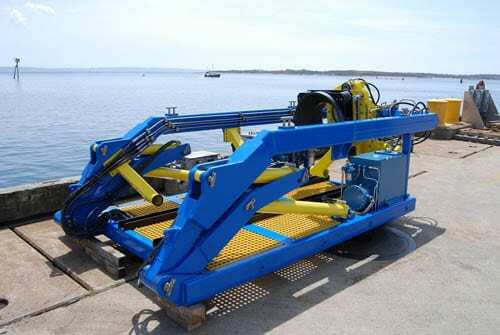 The REMUS Launch and Recovery System has made over 1000 successful launch and recoveries to date. Due to the vehicle's larger size, this self-contained system has been engineered here at WHOI in the OSL. It enables the L & R of the vehicle in sea states up to those created by the Beaufort Scale 5 winds. It requires only one operator and, therefore, does away with the need to use tag lines eliminating extra people on deck and creating a safer working environment. LARS is installed on the stern of a ship. For launch, the LARS has a built-in A-frame, which tilts the cradle up and over, while leaving the vehicle hanging by its nose well clear of the fantail. The cradle supports the vehicle during A-frame rotation, stabilizing the vehicle until it is a safe distance from the stern. The docking head provides damping to reduce swing in heavy seas. The vehicle is then lowered into the water, tail first, while the ship is making approximately 1-2 knots forward way (this allows the vehicle to stay well clear of the ships screws). All systems are given one final checkout before release. When ready, the vehicle is commanded to release its tow-line and begin its mission. Launch and Recovery System (LARS).